Sears was founded in 1893 and continues to be one of the dominant department stores in the United States. They have a large customer base, and their variety of high quality, affordable merchandise is one of the best that you will find. There are many job opportunities within the company, and growth appears to be likely here. Before you apply to work at Sears, here is the information that you need to know. There are a number of entry level positions at each Sears location. These include sales associates, cashiers, and customer service positions. These can be both part time or fulltime, depending on what you’re looking for. There are also department supervisors and managers, general management positions, and corporate roles within the company. Other positions, like quality assurance specialists, loss prevention managers, and others, will vary from location to location. Cashiers start out around minimum wage, but lead cashiers can make as much as $11 per hour. Sales associates can expect to make about $9 per hour once they gain some experience and show that they are going to work out with the company. Department managers and assistants should expect between $35,000 and $45,000 per year, while general managers can make as much as $80,000 or more, especially if they can provide decent profits for the company. Corporate roles pay based upon position and importance to the company. These include human resources, financial analysts, legal positions, and more. These jobs are typically based at a corporate office, many of which are based in the Chicago area. Sears has seen many ups and downs over the years, but they are still well positioned within the industry despite recent downs. They also do a good job of taking care of their employees by offering benefits to fulltime qualified workers. These include 401(k) retirement planning, health insurance policies, and corporate discounts. They also offer paid time off after a certain amount of time with the company is reached. To apply at Sears, you must be 16 for a part time job, and 18 for a fulltime one. You do not need any sort of formal education to be considered, but full time applicants with a high school degree or a GED tend to be given first consideration. Managers need to have this background, and for upper management and corporate roles, an appropriate college degree is expected. More importantly than this, applicants should have great people skills and be able to show potential for developing their skills when it comes to both customer service and sales. 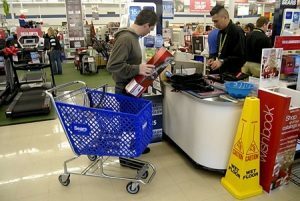 Sears employees are expected to place their emphasis on the customers’ needs, striving to help them while also helping the company by generating sales. They should always be there for each shift, on time, and ready to help. Not only is this good for the company, it will help you to advance within the company and further your career here. Employees are also expected to help push customer loyalty initiatives and make sure that sales levels are kept at or above appropriate levels. You can apply for positions both in-store and online. If you decide to apply in-store, be sure to dress nicely and in clothing that would be appropriate for the company. Also, act and speak professionally. Finally, do remember that there is a decent chance of having an on the spot interview when you apply in store, so bring a copy of your resume and be prepared for an interview before you go in to apply. If you are applying online, go to the home page, and scroll down to the bottom. Click on the “Careers” link and from there, you can search through job openings. You can also search by location. Whichever way you decide to apply, it is best to search through this before you go in and apply so that you know what opportunities exist before you begin. At your interview, dress nicely in the type of clothing that you would find at Sears. Answer questions directly and completely, and always prepare a few questions of your own for the end of the interview to further show your interest in the job.